I normally try to keep my expectations low when it comes to hot dog restaurants. I find it hard to top the iconic Arbetter’s in Westchester or Sweet Dogs in the Flagami part of Miami. 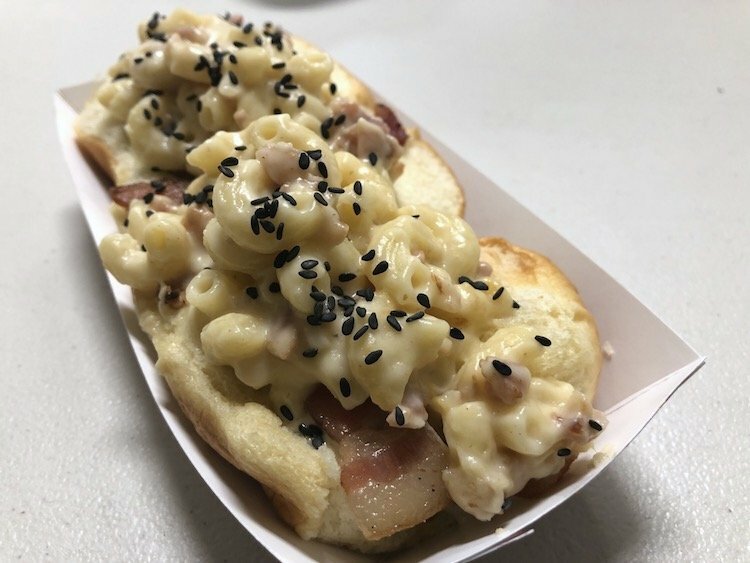 When I heard that the uber-popular Venezuelan Chef Cesar Gonzalez (@Co_Cinero) who some of you may be familiar with from his previous stint at Bocas House/Bocas Grill and currently at Taikin in Doral was behind a hot dog based food truck named El Alpha Dog, I was intrigued. As you can see on the menu below there are some creative dogs along with 3 burger burritos. I was with my cousin Fred and we started out with some really tasty Nestea Peach Tea. I’m not even a fan of Tea and had a couple of those guys instead of my usual cola. 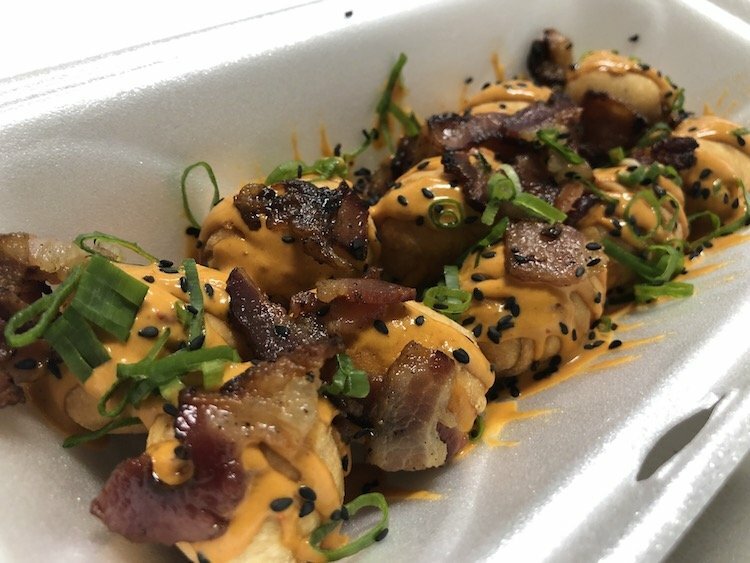 The Special Teque Balls which come 8 to an order are round Tequeños topped with Spicy Secret Sauce, Bacon & Green Onions, and Black Sesame Seeds. That Spicy Secret Sauce is most definitely spicy and needs to be bottled and sold. 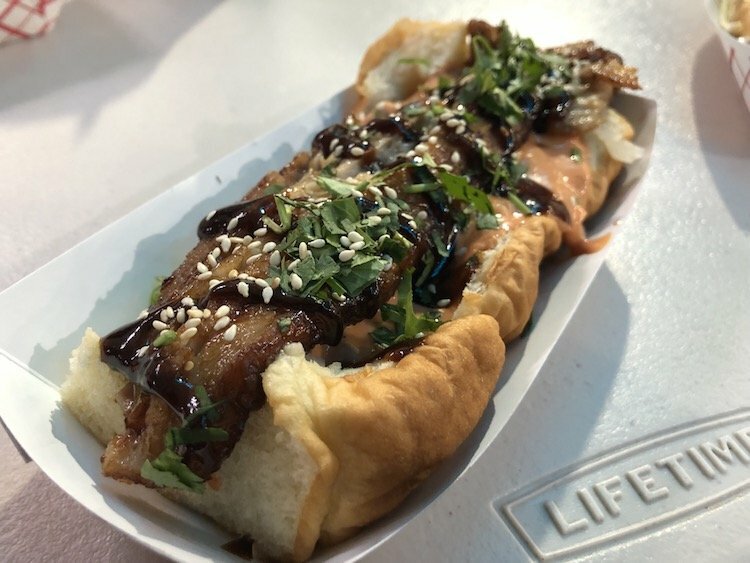 We had the Alpha Dog (Onions, Scallions, Alpha Sauce, Pork Belly, Korean BBQ Sauce, Toasted White Sesame Seeds & Cilantro) first which was a mistake. It was spectacular and no dog after it can follow, truth be told. 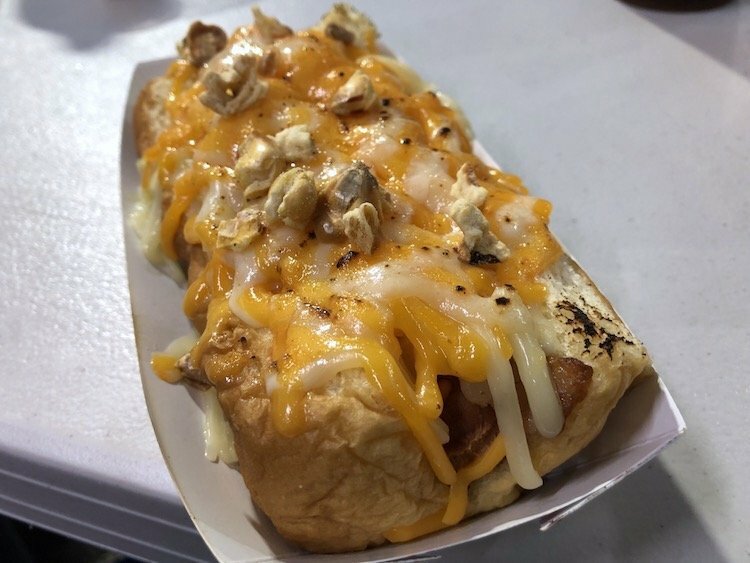 The Grilled Cheese Dog (Onions, Bacon, Pink Sauce, Corn Sauce, Cheddar & Mozzarella Cheese, Crispy Corn on top), the Alpha Truffle Dog (Truffle Sauce, Bacon, Mac ‘N’ Cheese, Crunchy Popcorn, Truffle Oil & Black Sesame Seeds), and the Clásico Caraqueño (Cabbage, Onions, Cilantro, Mayo, Ketchup, Mustard, Garlic Sauce & Grated Pecorino Cheese) which proceeded it was very good. 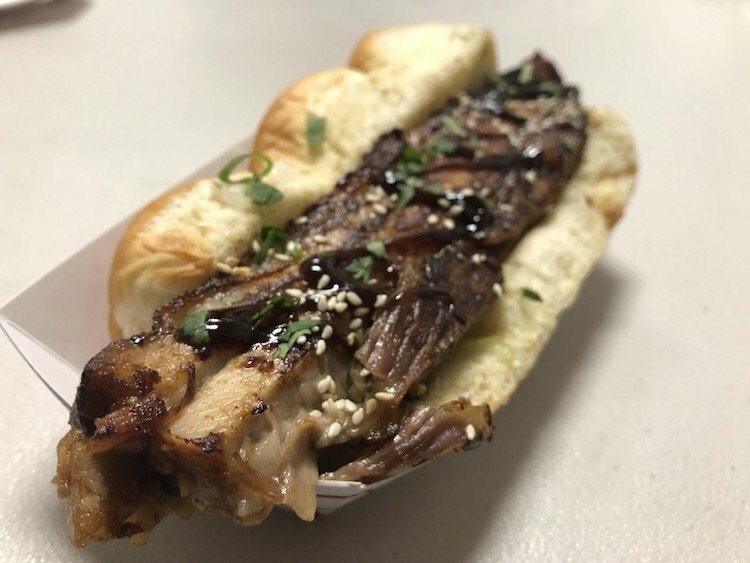 Maybe El Shanty (Onions, Scallions, Alpha Sauce, Double Pork Belly, Korean BBQ Sauce, Toasted White Sesame Seeds & Cilantro) could come close to the Alpha Dog but it had no dog and was a double order of that incredible Pork Belly so it doesn’t count. 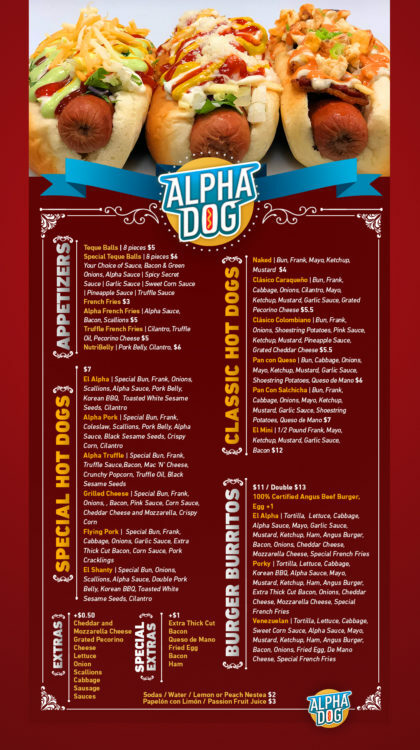 If I were you I’d order 2 of the Alpha Dog the first time you eat here and if you’ve got some room, then try out the other guys. 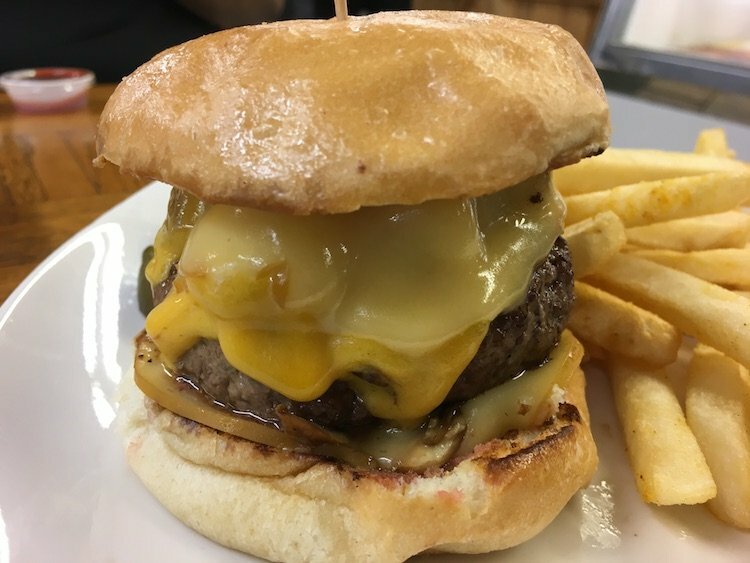 We could not stop talking about the Alpha Dog while we ate everything else. 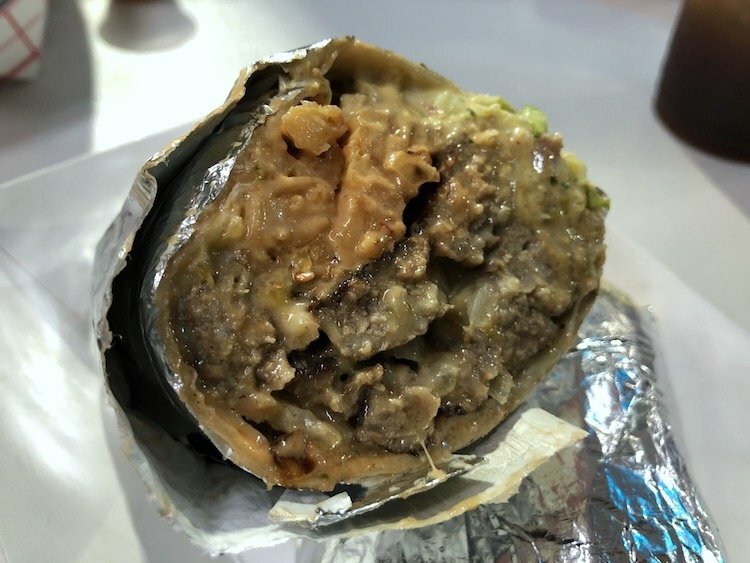 Ok, now that I think about it only eat one Alpha Dog and grab one of the stellar Burger Burritos (available in single or double patty). We tried all three but the Porky (Lettuce, Cabbage, Korean BBQ Sauce, Alpha Sauce, Mayo, Mustard, Ketchup, Ham, Angus Burger, Extra Thick Cut Bacon, Onions, Cheddar Cheese, Mozzarella Cheese & Special French Fries + Fried Egg) was the winner. I could do without the lettuce but then again I detest lettuce so that keeps with my regular routine. They were all worth a try but that Porky was just a little notch above the others. 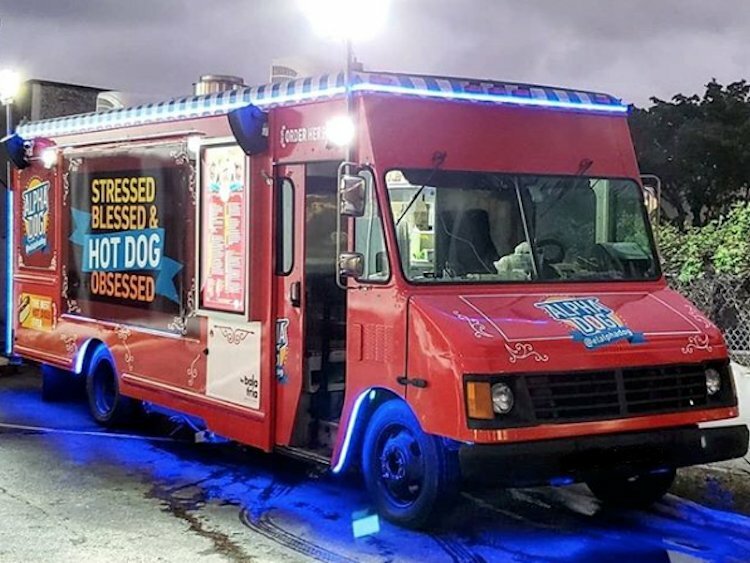 It’s been quite a while since I’ve been excited by a food truck, much less a hot dog concept that isn’t attached to some regional specialty. Chef Cesar has nailed it again and I’m excited to go back and try some of the other creations. I’m not gonna lie to you people, that half-pound “El Mini” is calling my name but you need to be mentally prepared for something like that especially when I’ve only got Alpha Dog on the brain.